Hello everyone, happy springtime! It has been absolutely gorgeous here especially with the mist and rain. The grass is finally green and sparkling with a million water droplets. I have been checking on my garden almost everyday. Soon there will be enough rhubarb to make my favorite rhubarb custard pie. I’ve used chives in just about everything for a week now. My garlic plants are fat and about a foot tall. This morning, I spotted a patch of wild violets near my Concord grape vines. This year, I think I will finally have a go at sugaring some violets to decorate cakes. Speaking of cakes, I celebrated my birthday recently. Keith surprised me with a cake made by Erin from Enos Farms. I had never been so excited to open a box of cake. 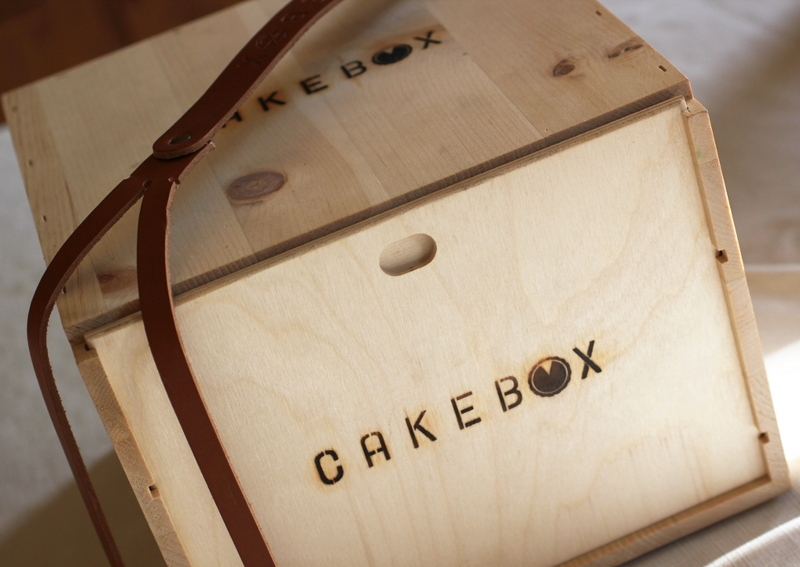 A cake in a wooden box with a leather strap! I seriously imagined a fluffy bunny with a half-eaten cupcake inside. When Keith told me it was made by Erin, I really wanted to see what kind of cake it was. Two years ago, I asked her to make my birthday cake. It was a white cake with strawberry preserves, vanilla buttercream frosting, decorated with apple blossoms. 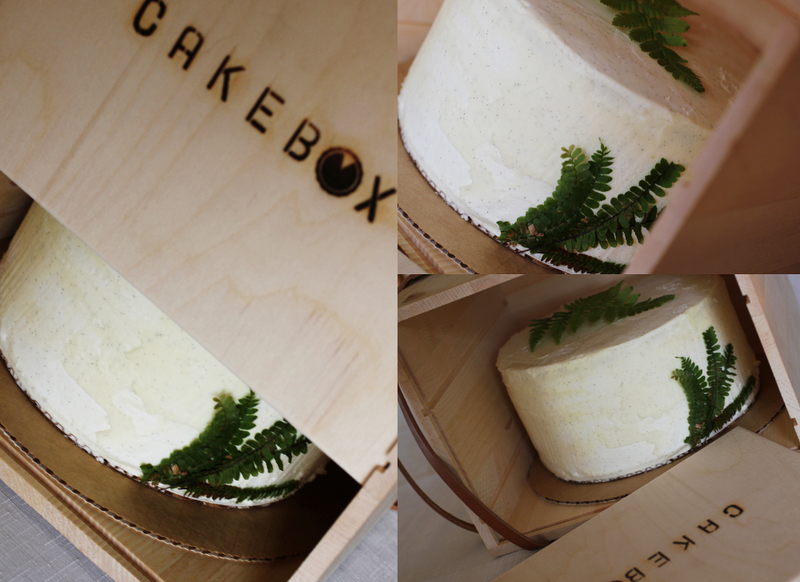 Frankly, it was the best cake we had ever had until this one came along. Let’s just take a moment to look below. What do you think? Absolutely elegant, isn’t it? Erin and her husband Jeremy operate Enos Farms. They farm in Wyoming Valley on the land of Jeremy’s Great Great Grandfather, Enos Lloyd-Jones. 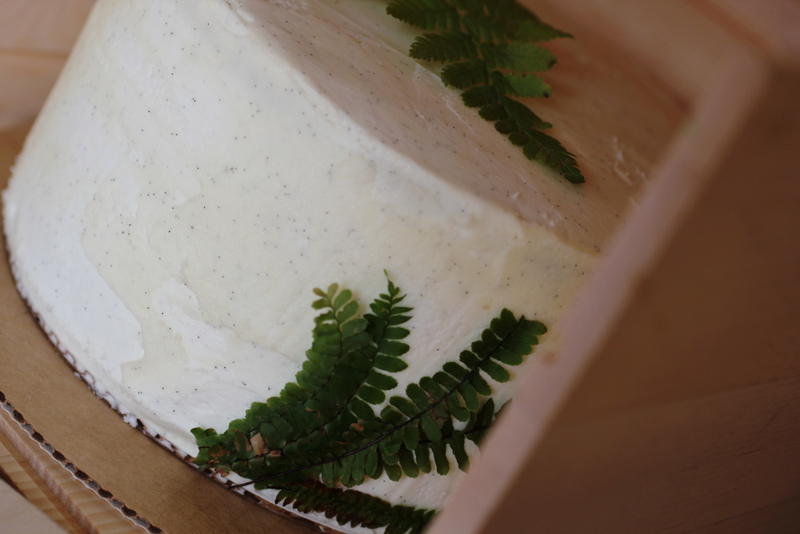 They use what they grow for their catering as well as for special dinners on the farm. Check out their website for more information. Now let’s get back to the scrumptious beauty below. 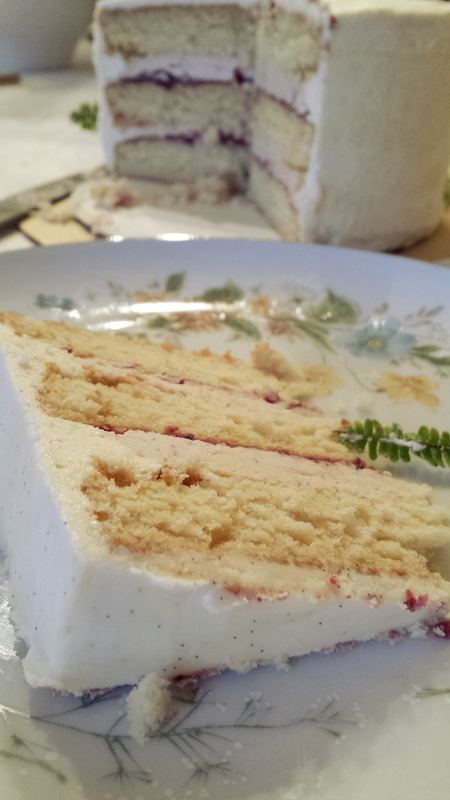 Lemon-drop cake with plum preserves between the layers and vanilla bean buttercream frosting. A touch of fern. We served it with some pink bubbly and enjoyed it in the company of good friends. Cheers!